Another release packed with new functionality, improvements and resolved issues. Let’s have a look at some of the most important changes and a sneak peek of what’s in plan for the future. One of the most popular DataDear reports, the Profit and Loss Multiple Period report has just received another massive improvement. A new tick box in the parameters window will allow you to show the multiple periods as rows instead of as columns. This means that a flat P&L report will be generated for the selected organisation / group where each line will only have 1 period – for each period the full P&L is replicated as another set of rows. This is extremely handy when generating Excel pivot tables on the P&L data – such as for easily slicing data by tracking category for a single organisation or a group. With this update, it is now possible to create a report which is able to track and drill down the P&L by a tracking category – even across a group of companies. The sample below shows a group of Xero organisations in multi-currency and different tracking categories. Such a sample report will be available on the DataDear Dashboard in the next release. The first POST template for QuickBooks Online has been launched during the Accountex event held in London. This template was demoed on the DataDear stand and initially distributed to a few users for their initial feedback – which so far is encouraging. This DataDear POST template has been re-invented – not only allows you to create journal entries in bulk, but can also be used to GET journal entries from QBO, edit these and update these in QBO. This is a new concept which will eventually be adopted to all other templates including the Xero POST templates. If you would like to receive a copy of this template, please contact the support team. The data tables for QuickBooks Online just got better. For some data tables, such as the Invoices, more columns have been added to the downloadable data – it was noticed that some of these columns were quite important when there is a need to generate some specific reporting. The QBO api was therefore further exploited to include these columns by default. You may also delete extra columns since these will remain deleted even after a refresh. A new data table (Billable Expenses) has been added to the DataDear Excel for all Xero organisations. Billable expenses are costs you’ve been charged that you want to recover from your customer. To use this data table, simply choose a Xero organisation and select the Billable Expenses / Linked Transactions table from the drop-down list. Read more about Billable Expenses in the Xero Help Centre. The DataDear API, is gaining some further interest within the developer community. It is our intention to keep evolving and improving this area. New reports are being generated to ensure consistency between the Xero and QBO offering. As promised in the previous months, the postman page explaining how to use the DataDear API has been published and can by accessed by following this link – DataDear Postman page. Xero & QBO data tables – the ‘unique records’ in the parameters window is now unticked by default since this may have created some problems when ticked by default. QBO – New reports – more DataDear reports will be developed in June so QBO you will enjoy the benefits of the account details and multiple period reports which are currently only available for Xero. Making tax digital – As a bridging software, DataDear will be fine-tuning it’s offering for the MTD with the aim of allowing the Excel spreadsheet and the cloud accounting software to work in tandem. 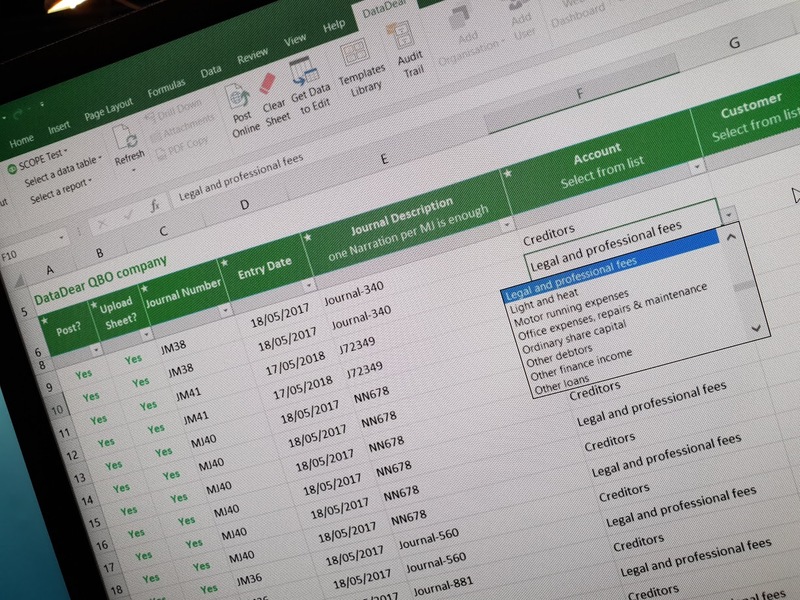 Once a basic ledger has been created for the organisation, it will be able to push data from DataDear’s validated spreadsheets to Xero or QuickBooks Online and filed with HMRC from there (the validated sheets will be filled in by the business user/accountant). A new template has been developed and is currently awaiting for feedback from accounting partners in the UK. If you wish to be involved in this cycle, please contact the support team. Performance improvements – as DataDear grows bigger, regular optimisations are required to ensure data keeps arriving as fast as possible – a research exercise with a local University has started to look at ways in which performance can be improved. An area which is being explored is how to improve the retrieval process of the data loading in templates. That’s it for this month – let us know any feedback on this or future releases!